Located on the first floor of the Williams Center, The Spot features the Tim Hortons Cafe and Bakeshop. The Spot is a favorite place for students to relax between classes and at night. If you enjoy coffee, then The Spot is the place for you. Offering a wonderfully relaxing environment, this venue is a great place to gather with your friends during or at the end of a busy day. 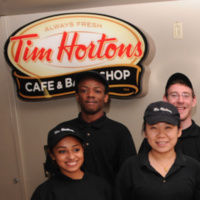 Tim Hortons serves a variety of doughnuts and pastries baked fresh daily on campus. Stop in and enjoy a sandwich, soup, specialty coffee, or iced beverage, which are always featured on the menu. Students may use their meal plans to purchase food and drink items. To reserve The Spot, please contact the Campus Life Office. WHOA Presents... OPEN MIC NIGHT!